Now that Carlos Condit will no longer fight Matt Brown tonight at UFC on FOX 9, as the latter recently withdrew due to a back injury, it remains to be seen what’s next for the promotion’s #1 ranked welterweight. 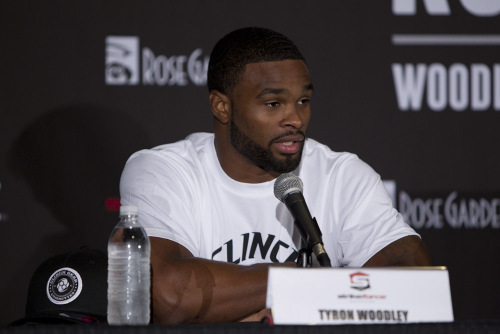 Condit recently relayed he hopes to have his bout with Brown rebooked soon, however, Tyron Woodley has made it clear he’s interested in fighting the “Natural Born Killer” first. Dana White reportedly has said the promotion is hoping to schedule Condit for a fight at UFC 171 on March 15th, which will also feature Johny Hendricks taking on Robbie Lawler for the vacant welterweight title. With Georges St. Pierre having vacated the title, Condit could be booked for a title shot eliminator. Condit hasn’t fought since UFC Fight Night 28 in August, when he stopped Martin Kampmann in the fourth round.